Formula 35*11117 The formula number on the label identifies the ingredients used to make that particular product. Our three layer pad is a cloth-like material that provides a non-abrasive surface for scrubbing. Alkyl polyglycoside is a widely used cleaning agent, or "surfactant," that is derived from sugar, and can be found in many household cleaning products. It removes dirt by loosening it from a surface. 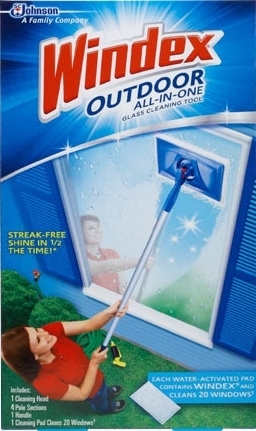 It also aids streak-free cleaning. Mirapol® Surf S-300 is a cleaning agent and film former that works in combination with rinsing water to keep surfaces cleaner longer. It works by first attaching to the surface, and then helping to prevent soils from attaching so that they can be washed away by water without leaving streaks. It is especially good at helping prevent streaks on glass surfaces. It is a trademark and product of Rhodia Inc., which is responsible for its contents.